"The Fair Lady", Chair of the Santa Cruz County Fair Home Arts Department for 51 years, and an adopted Grandmother to many of us. She was loved by all who knew her and will be missed terribly. The Home Arts Department will not be the same without you. Rest in peace in the arms of our loving Father. 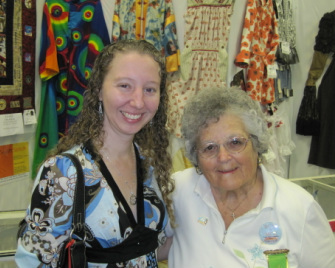 Marie was the ever present rock of the Home Arts Committee and the Santa Cruz County Fair as a whole. I was privileged to have served under her for a few short years before moving to college. But even before that I grew up with her. I was a part of her second family, her fair family. Marie would excitedly tell stories every year how she watched my brother and I grow up. First when my Mom was an exhibitor. She remembered how Mom made all of my "first day of school" dresses when I was young. It was always the dress that won the best of show that year. Then when my brother and I started exhibiting, like a Grandmother, she would proudly present us with our ribbons and sweepstakes awards. During high school, I started volunteering on the Home Arts Committee. I learned so much about working hard, loving others, having a positive outlook in all aspects of life, and being grateful for every moment that we are doing something we love. When I started college at UC Davis, I was unable to continue on the Home Arts Committee, but I continued to attend the fair each year solely for the purpose of seeing Marie. And when I graduated from college and graduate school, she was included in all of the invitations and photos reserved for family members. She was my Grandmother after all, because as Marie always pointed out, family isn't just about blood. In fact, it has nothing to do with blood. Family is all about love, and nothing else matters. I love you Marie. My life will not be the same without you, but I will carry you with me always.